Ara is an automatic editor of RSS feed. Only the links towards the Web pages must be given to him. 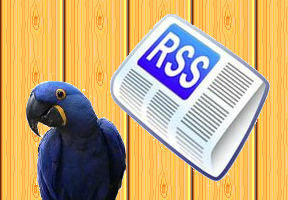 It is able to retrieve the title and the description of the pages and to produce a syndication file in the RSS format. It enables you to select the pages to be syndicated instead of publishing the last articles systematically as the generators included in content managers do it. The Ara term means "Atom and RSS API", it is also the name of a species of parrots from South America. The program is a set of PHP scripts which have to be stored on a Web site. One creates a feed from the browser by entering the URL of the interface, ara.php. It is easier to use the program with two browsers, one to display the pages to include and to copy the URLs from the URL input field, the other to edit the RSS file. Thus by just a cut and paste action one transfers the URL from the field to the interface and one clicks on "Add" to add it to the list. The EDIT button on the left of the link makes it possible to modify the title and description if one wants. To generate the feed, one enters the name at top if the file already exists, or at bottom for a new feed, and one clicks on the Create and RSS feed button. Ara is not a simple editor, when a page is added, it is reads for extracting useful information and for this purpose Ara makes use of Ajax (with the Anaa framework ), but Ajax can read files only from the site where it is installed. Actually the goal is to build the feed of the site, just avoid to give URL to other sites. It is an Ajax script with a backend in PHP 5. In the current version only the pages of the website where it is installed can be added to the feed. It is necessary to be authenticated to use it, to this goal the install.php program allows to register a login and a password. This file must absolutely be be erased. Once registered, the user remains registered for the whole session, even if he reads other pages meanwhile. To generate the contents automatically, the program loads the pages given in the list and reads in the head section the contents of the title and description tags. If they are missing, the first H1 tag in the body of the page will be used for the title instead. The same if description misses, the text of the synopsis will be taken from the page instead. The Ara manual describes the use of the interface and the various options, as well as the architecture of the program. The manual is written with Open Office, you can build a PDF version with the export version of the HTML processor. The file includes the editor and the scripts of authentification, as well as the Common RSS script to display feeds on Web pages. The manual is included also. You may test you feed with the demos of the RSS Reader. The ara directory holds a log file, ara.log. Load it (it may be displayed by notepad) in case of trouble. Fixed a problem which can arise when the page has no description tag. Fixed clear all command in the editor. Modified the code for compatibility with recents versions of PHP. The program has been modernized for the last versions of PHP. Fixed login issues. A logout command has been added. The date for the channel is now changed with each update of the feed. Editing the channel is now mandatory before to create a feed, to avoid missing fields that could prevent it to be loaded. The Show button now displays title and description of the channel. Added a Hide button to make space after the channel is displayed. ajax-check.php and ajax-test.php are included to check the system and verify it is compatible. Titles now encoded to prevent them to be shortened at special chars such as quotes. Encoded the links to allow URLs with parameters. Cache disabled when the feed is loaded to be displayed. Descriptions are shortened at last dot when possible. Fixed the path of the RSS file on the server. The format of the date was wrong, but from the edit form, changed to GMT. Added option for recognition of the IP address of the webmaster to avoid entering a login. The choice of using the option is made during installation. Added the option "Last at top" that is checked by default. This allows you to add latest articles to the top of the list to have a descending chronological order and so you can use the feed directly to display most recent articles. The max size of titles is now defined from the TITLE_MAX variable. The max size of descriptions is now defined from the DESCRIPTION_MAX variable. For foreign languages, HTML codes are replaced by UTF-8 characters with accents. Added the See RSS feed button. Display of the channel's title with the "view" button. The default date is the date of the day. Titles were not modified in the list after editing. Fixed. Removed superfluous antislashes added by Ajax in descriptions. The default RSS file is now taken at root of the site. Replaced the global variable $login in install.php by $ulogin that is local (globals are not enabled by default). Thanks to Pablo Javier to have found the bug. 1.0 - August 2007 - First Release. The software and all scripts which it contains are under the GNU GPL 2.0 license. You are free to use the scripts on your site, but you must maintain the copyright notice containing the name of the author and the links on the site of the author (scriptol.com) if either you distribute a modified version. Open source software under GPL 2.0 license. Written by Denis Sureau. ARA Editor doesn't "edit" existing feeds.